← James MacDonald and Harvest Bible: What Don’t They Want You to Know? That day we headed out to the Mount of Beatitudes. I used to picture it in my mind as some dry, dusty hillside. However, it was absolutely beautiful, filled with trees and flowers. It is located on the Sea of Galilee which is spread out below the Mount. Again, I was struck by the number of languages being spoken around me. I met a large and friendly group of Nigerian pilgrims. Their pastor asked if we could take a picture together which is what you see at the top of this post. 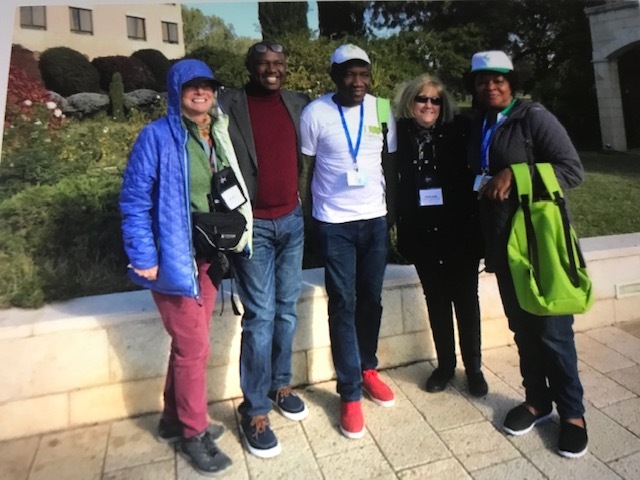 We would bump into this group many times along the way and I have as cool story to tell about our time together in the prison in which Jesus was held the night before the Crucifixion. I sat down on the grassy hillside and contemplated how the story of Jesus reaches across all nations and cultures throughout time and continues to draw people back to the place where it all happened. I began to understand why Jesus chose that time and place for his ministry. If he had come today, people would be hustling and bustling about, noses stuck to their cell phones, demanding He get on with His point. Instead He chose a time when people would be willing to gather on a beautiful mountainside and listen to Him for hours. My group then read the Sermon on the Mount in the quiet and beauty of this place. Our guide was a Messianic Jew whose Jewish family emigrated to Israel from Australia. He was wonderful but more on him later. Yesterday, I stopped the post at the point when James MacDonald decided to drop the lawsuit. It appeared obvious to me that he did this because he did not want the defendants (sorry about the confusion yesterday) to have access to some super secret documents. To observers such as myself, it appears that he didn’t want people to know where the money was going. Surely he understood how this would be viewed by others. Yet, keeping the information was so important that he was willing to risk the inevitable derision. I predict that the beans will be spilled in the near future. It always happens. Do you think Jesus intended for pastors and churches to conceal things in such a manner? HBC elders continue to back James MacDonald in spite of constant controversy over years. The leadership of HBC disputed this post, basically saying “Nothing to see here, move along.” They only wanted *unhappy Christian to find peace.” Seriously? However, many were not buying it. We have chosen the high road and refused to engage in public assault on people we once served closely with who just can’t seem to “let it go,” even after all these years. The Elders are privy to many grace-filled private attempts to reconcile, extended in hopes that these unhappy Christians would find peace. The HBC elders and the peacemaking process: Most *peacemaker* groups are biased towards leadership. It appears that the elders got tired of tap-dancing and decided to pay others to take the heat off of them. Christianity Today posted James MacDonald Takes ‘Indefinite Sabbatical’ from Harvest Bible Chapel which links to a statement by HBC elders and James MacDonald on January 16,2019. According to the elders, they suddenly realized that they had failed to address the increasing criticism over the last few years. This raises the question: Did they really overlook the criticism or did they discover that all of their seemingly abusive tactics only made things worse? TWW has written about such groups in the past. Most peacemaking ministries market themselves to church leadership. It is the church leadership that pays the bills for these expensive peacemaking sessions. I am of the opinion that the system is biased against the victims and biased towards the church leaders who pay the bills. Therefore, I hold out little hope for real, deep change in the HBC system. Maybe there will be some window dressing. However, the entire structure needs to be gutted and a new ideology and structure needs to be instituted. James MacDonald and the Naples sabbatical: He’s getting out of Dodge and letting some hired *peacemaking group* deflect the slings and arrows. MacDonald had this to say in the update. I recently spoke with a person who said that MacDonald has pulled the *mea culpa and forgive me* routine in the past. After attending his church for many years, they left. They said they didn’t buy his crocodile tears then and they don’t now. Look carefully at his statement. Here are some of my thoughts. The rumors of his lovely home in Naples may mean that this was in his long range plan all along. It appears that his sons will stay in Chicago. Will they take over the HBC pulpits? He fully intends to preach at Naples. Is this a way to stabilize an income stream? I think he may be counting on the *peacemaking* process to grease the wheels for his return. Given the history of some of these groups, he may be onto something. It appears he may believe that this thing should be over with when spring warms the streets of Chicago. Could he be developing a plan to takeover the leadership of HBC Naples as well as to return as the head of all HBC entities? John Secrest, the current pastor of HBC Naples, is fired. The baloney continues ad nauseam. This situation proves that some things never change which gives me little hope for improvement in the HBC system. The Christian Post published Harvest Bible Chapel-Naples pastor fired amid fallout over James MacDonald sabbatical, scrutiny on January 20, 2019. It looks like MacDonald did not consult with the current pastor, John Secrest, of HBC Naples, before announcing to the world that he would be preaching at that location. Secrest was not amused. His church had only become the eighth location in MacDonald’s new empire in February, 2018, and he decided he wanted his church out of this arrangement. Secrest also requested that the Florida church return to local autonomy, ending the partnership agreement. HBC central and MacDonald once again proved that they have no interest in changing their modus operandi. If MacDonald wants a pulpit in Naples, he will get that pulpit in Naples. I believe that HBC Naples should, and will, pull out of HBC. Here is a piece of advice to Naples. Do not wait around for the peacemaking solution. MacDonald is not going anywhere. James MacDonald and HBC: Pay the legal costs of the defendants. Then I will begin to consider that there is real change afoot. Wow… These developments are unbelievable. On second thought, maybe they are not so unbelievable. They are sadly becoming routine. There’s just too much drama in this whole mess. The level of un-Christlikeness is reaching a new high in mega-mania. JMac and the HBC elder board have some real problems on their hands because they are the problem. I can’t believe folks are actually supporting this with their tithes and offerings. All this talk about reconciliation and relational healing is a trick. My theory is that they are avoiding, in their public statements, talk of ‘repentance’ and apologies and ‘we were wrong’ because it could be an admission of guilt in civil or criminal matters. They are hiding some dirty stuff… that much is certain because of how quickly they dropped the lawsuit once they realized that the discovery process was going to open their floodgates. If they were to pull a King David and state outright “I have sinned against the Lord” and publicly confess to something, it could come back around on them in litigation. Never mind the fact that, biblically, you should not be trying to soften the blow of the consequences with further deceit when you are repenting. My guess is that JMcD planned to move south to Naples and needed a church to be his, and planned to leave the Chicago empire to his sons. HBC is heading down the Mars Hill path, and for the same reasons. No surprise, since JMcD and MD are chummy together. It will be too bad when such a large church implodes due to MacDonald’s hubris. Many will be hurt and turned off toward church in general because of it. Just take a look at the ad Warren Throckmorton posted and see if you can see the discrepancy between the HBC elders statements and the ad. Also look at the date, which starts before they fired Secrest. I’d be mad if I were him, too. There was also someone on Twitter who said that Macdonald made statements during the Closer Campaign that he wanted the church become debt free so he could pass it on to his sons and move to Florida. I wonder if HBC Chicago reached out to Naples with the intention of taking over that church and giving it to Macdonald. They were probably planning to fire Secrest all along. And that would make Secrest’s statements about HBC Chicago misrepresenting the satellite campus agreement make perfect sense. “I have long known and taught it is not about the messenger, it is about the message…”. Is he really saying that it doesn’t matter what he does, so long as he preaches correctly? If that’s the case, he’s sicker than I thought. Sorry Mac, but I have long known that a person’s lifestyle and actions are PART of their message, and an integral component of a person’s testimony! However, your lifestyle and behavior are drowning out any ‘message’ you could possibly hope to deliver! Is he really saying that it doesn’t matter what he does, so long as he preaches correctly? This is basic New Calvinist theology. Everyone is a sinful worm deserving of God’s destruction, even after being elected. They always use that to defend pastors staying even if they are doing very wrong things. John Piper writes on that a lot. However, that theology is not universally applied. It’s usually only applied to pastors. If anyone else does anything that a pastor thinks is causing problems, they are church disciplined. Particularly women, who are required to be perfect servants to the men around them. I’ve said this before, but New Calvinism is a theology that I believed is designed by these men to support their abusive actions. I don’t believe it stems at all from the Bible. They just cherry pick the Bible to support their actions. ishy: This is basic New Calvinist theology. Everyone is a sinful worm deserving of God’s destruction, even after being elected. They always use that to defend pastors staying even if they are doing very wrong things. John Piper writes on that a lot. Yes, and as I have learned, it’s not a matter of “do as I do” it’s a matter of “do as I SAY do!” The rules don’t seem to apply to these ‘elected-super-special-representative-of-God-on-earth’ pastors! So, I guess I Timothy 3:2 and Titus 1:7 aren’t in MacDonald’s Bible? Hey…if THEY can use clobber verses, then I reckon I can too! I wished logic worked on the New Calvinists I’ve known, but it hasn’t at all. Particularly strange is that they are always claiming to be the most logical and the most biblical. Even stranger is that they don’t even try to meet these inconsistencies. They just change the subject. If it doesn’t match their theology, they completely ignore it. Like how they ignore everything Kisses said and did. Most of them don’t even realize their church doesn’t teach about Jesus. Lol phone autocorrected Jesus to kisses! Reminds me of SBC’s “Peace Committee” several years ago that looked into concerns about New Calvinists causing disruption in SBC’s traditional (non-Calvinist) churches. The committee was headed by Frank Page, CEO of SBC’s Executive Committee (who later resigned due to moral failure). Page and his committee concluded that there wasn’t a significant problem with New Calvinism and advised all Southern Baptists to agree to disagree, get along to go along, and make room under the big SBC tent for diverse theologies. Well, that “peacemaking process” unleashed much discord not peace in SBC life as Calvinization of the denomination was given a green light to proceed. IMO, SBC’s peace mission was biased/influenced by the reigning SBC King at the time, as well as now … Al Mohler. Since that time, SBC has become essentially Calvinized throughout its entities (most seminaries, home and foreign mission agencies, publishing house, and a growing number of churches). Peace?! Ishy: Even stranger is that they don’t even try to meet these inconsistencies. They just change the subject. Well, that’s part of the “mystery” of Calvinism, isn’t it?!? But yes, you are correct. Logic is wasted on a lot of them, because sadly, New Calvinism is all they know, or even want to know. I begged our former YRR Neo-Cal pastor to abandon the hurtful “9-Marx” things he was doing in our church, but he honestly didn’t know anything else. He was much like a Borg drone…”Resistance is futile, you will be assimilated.” It’s all very, very sad really. He would’ve been OK if he would’ve listened to the wisdom of people who have been Christians for better than 50 years instead of listening to Mohler and Dever! But his arrogance and pride became his undoing. A polite understatement, if ever I heard one. A less kind and gentle person might suggest that these ‘Peacemaker’ organizations exist to silence and disburse dissent, under pretense of adhering to scriptural principles of addressing relational issues. Authoritarian narcissists who line their and their family’s pockets, who manipulate and abuse others, sexually among other ways, for their own self-serving purposes will – without fail – end up on the wrong end of some hillbilly’s shotgun. And the peacemakers’ job is to convince those hillbillies they are wrong, that ‘violence’ is unchristian, and that they should all just shake hands and go home. What do you call ‘making peace’ between abusers and victims of abuse? That’s what most christian ‘peacemakers’ do. And this is the latest strategy chosen by Harvest. Time to unmask the ‘peacemakers’, which in their modern incarnation, are not so blessed. Root 66: He would’ve been OK if he would’ve listened to the wisdom of people who have been Christians for better than 50 years instead of listening to Mohler and Dever! But his arrogance and pride became his undoing. This a direct effect of the cult of personality. The young reformers idolize Mohler & Dever … they must be right and everybody else wrong. Same thing going on at HBC; JMac is in control of the wheel. Wisdom is trampled in the street, as the pulpit wins and the pew loses. Me thinks that the reconciliation procedure in Mt 18 is feasible and can lead to a good outcome only when all parties (but especially the more powerful party) are dealing in good faith. The brains of people with sociopathic traits are distinguishable from the general population in functional MRI scans. The consensus in the medical profession is that people with these traits do not change. Counseling, therapy, confrontation, soul-cure, you name it; nothing works. The only humane solution is to keep them out of positions that give them the power to hurt others. For that, of course, one needs to identify them. I think that the day may be coming when the churches will loosen their grip on a purely bible-derived anthropology and subjective assessments of the character of people hired from far away to fill responsible offices, and will demand for such hires more nearly objective proofs that they are not evil-minded people. MMPI probably would be adequate. If fMRI ever becomes cheap enough to use as a routine screening tool, that might be better. If we don’t self-assess, the world may do it for us. A great example of why church autonomy is so important. The Christians that establish and build congregations should be the ones who make the decisions for that congregation and its assets. Churches should not relinquish this stewardship responsibility to groups outside the church. I feel bad for Secrest. It just seems to me that this was a classic take-over of a church so that McDonald could have what he wanted. It seems completely planned. It’s disgusting that this is all done in Jesus’ name. Oracle at Delphi: A great example of why church autonomy is so important. A mega-church multi-campus system in which one man is in control is an accident waiting to happen. If THE MAN wants to preach at another campus (e.g., to take a sabbatical in warmer climes over the winter), the resident pastor must step aside to make room. Bridget: It’s disgusting that this is all done in Jesus’ name. We don’t need to drag Jesus into this mess. I have a feeling that He left a long time ago. Ishy: I wished logic worked on the New Calvinists I’ve known, but it hasn’t at all. Particularly strange is that they are always claiming to be the most logical and the most biblical. My experience has been that they will often start raising their voices and flying into rages. Most neocalvinists are in my experience little, insecure boys who are quite terrified that the pegs of their theology might be knocked from under them, so they’ll try to bully any opposition into silence. This is very typical of one who derives no comfort from the Lord and has no peace in their beliefs. I think a very high percentage of neocals (as opposed to old school reformed types from way back) have nothing but a series of doctrines and memorized scriptures and heroes to worship—but many of them do not appear to have the joy and peace that comes from a real relationship with Jesus. Yes, church autonomy is important, as well as a congregational polity. I know I’ve harped on this before, but when I discovered that members at HBC had no voting rights, it all fell into place and made perfect sense as to how JMac and Co. ran around unchecked and accountable to no one! When much the 501c3 church is going to the proverbial dumper around you, just put this on and listen, and appreciate, nice again, the quality of life things of beauty. Important to the pew but not to a mega-maniac pulpit! That’s why JMac taught that congregational governance is from Satan. An authoritarian narcissist can’t control and manipulate the congregation if the pew has the power to question and cast votes. HBC members, do y’all get it yet? I could have said it better myself! The whole statement is full of Satin ick verses, but let me break this one down. “Our hearts are grieved” THEY aren’t grieved one bit– it’s just their “hearts”– some separate silly sappy sentimental entities. “as John’s contributions” Not like he’s the founding shepherd or anything– he just did what you do when you drop contributions in the plates. “to the Naples Campus” Not a church or anything– just a branch of a Chicagoland business. “cannot be understated.” You heard them right. He never really contributed much of nothing to nobody nohow! But personally- I could care less! The nature and extent of the Christian Industrial Complex in America should make us all sick to our stomachs by this point. Max: Important to the pew but not to a mega-maniac pulpit!That’s why JMac taught that congregational governance is from Satan.An authoritarian narcissist can’t control and manipulate the congregation if the pew has the power to question and cast votes.HBC members, do y’all get it yet? Yep, I would never join a church that doesn’t let members have any say on anything! My fear is that the people of HBC know that they’ve been taken to the cleaners, but don’t know what to do about it. Without voting rights, they really have no recourse but to leave! What a contrast between the words Jesus spoke on the Mount of Beatitudes and the abusive behavior exhibited by James MacD and the leaders of Harvest. Root 66: Well, that’s part of the “mystery” of Calvinism, isn’t it?!? But yes, you are correct.Logic is wasted on a lot of them, because sadly, New Calvinism is all they know, or even want to know.I begged our former YRR Neo-Cal pastor to abandon the hurtful “9-Marx” things he was doing in our church, but he honestly didn’t know anything else.He was much like a Borg drone…”Resistance is futile, you will be assimilated.”It’s all very, very sad really.He would’ve been OK if he would’ve listened to the wisdom of people who have been Christians for better than 50 years instead of listening to Mohler and Dever! But his arrogance and pride became his undoing. Yes pride…. it’s really the only temptation that we can’t see coming. it’s like living in a prison, and the prison walls are glass. I used to be a proud Calvinist, even after I got the left boot of fellowship. But I have to agree with you, and it almost makes sense given that the original Calvinism was created by a power-grabbing murderer of Christians. In case you’re wondering, I still believe in both predestination and free will at the same time (a la Jonathan Edwards) but I’m now a universalist who believes even the devil will be saved: everyone is ultimately predestined, so that nothing God sent out from Himself will return to Him void, and so that every knee in heaven and on earth will bow and confess their Savior. The Windies were eventually dismissed for 289, bolstered by a splendid 81 from Shimron Hetmyer. Otherwise, the tail signally failed to wag on this occasion, with the last 5 batsmen failing to outscore the extras between them. But apart from Darren Bravo who went for 2 at number 4, the others all contributed; the total is disappointing but not disastrous. England are currently 30-1 in reply, with Keaton Jennings falling for just 17. We may well be about to teach the Windies the true meaning of “collapse”. Michelle Van Loon: What a contrast between the words Jesus spoke on the Mount of Beatitudes and the abusive behavior exhibited by James MacD and the leaders of Harvest. As the news about JMac and HBC unfolds on several fronts, I have yet to hear anyone accuse these leaders of being Christlike. Root 66: Without voting rights, they really have no recourse but to leave! And then have to endure shunning by those who stayed. These systems are a lose-lose situation for members. “Do you think Jesus intended pastors and churches to conceal things….? I’m going to take that as a rhetorical question. All eyes are now turned to HBC-Naples. Will MacDonald actually preach there? Max: All eyes are now turned to HBC-Naples. Will MacDonald actually preach there? That congregation needs to wake up and take action to protect their church! You appear to have far greater faith than I in the madmen who have brought us endless ways to torture and murder one another, always, of course, in the interests of ‘truth’, ‘freedom’, ‘justice’ and the ‘pursuit of happiness’. I’m not ready to trade one bunch of controlling narcissists for another. Honestly, our problem is not that we need a so-called objective reading of a man’s brain by a so-called trustworthy instrument designed by so-called trustworthy men. Any reasonable, honest person could look at James MacDonald’s actions and find him wanting. But no, we are persuaded, as with our favorite illusionists, to merely look at his ‘words’ which speak eloquently of God, love, truth and justice. Indeed, as a wise man once said, we would do well to do as our so-called leaders say, but not as they do. I would reject the notion that we need more sophisticated tools upon which to ‘judge’ the trustworthiness of men. If we are honest, we can tell, almost immediately, who is genuinely Christlike, and who is not. That is, if we demand a flock in which the shepherds are intimately known, rather than a vast man-made organization in which the sheep may never have even personally met their shepherds. I will confess that in my own experience, I knew my false shepherd. It was a small flock. And from my earliest days, and throughout the decade in which I ‘followed’ him, there were many red flags. More than once were concerns shared by others of the manner in which he treated his own wife and family; of his lack of any apparent warm, intimate relationship to any other person, including wife, children, siblings and parents. Even before I thought to look for inconsistencies and lapses in logic in what was said, I could see many warnings that there were some serious inconsistencies between what was ‘said’ and what was ‘lived’. Yes, you might argue that the really clever narcissistic sociopath can fool a lot of people for a long time. I tend to believe that it inevitably entails some manner of ignoring the warning signs, or perhaps not knowing what the true measures ought to be. You truly can know a tree by its fruit; an apple tree will never produce plums. Our problem is that we have been misled into judging the tree by its appearance. We are deceived into examining its shiny bark, fragrant flowers, towering height and pleasant shade – and we forget to look at the real, telling fruit, or lack thereof. The likes of Driscol, Hybels and MacDonald produce a lot of exciting things that a lot of people like to experience. But anyone that ever knew the men personally could tell you about their real fruit, what happens behind closed doors, how they treat their wives, children, friends and associates daily. Now I am ashamed that I was ignorant enough to not look closer at the real fruit of my pastor. Yeah, he was clever, and put on a good show. He could talk the talk really well, and provide the type of ‘worship’ experience with which I was comfortable (which is not the more popular style of contemporary ‘worship’). Perhaps we have forgotten what ‘shepherds’ are for, and have been deceived into believing that charismatic celebrities who can put on a good show are far more valuable than humble men who will lay down their lives to protect the weak and needy? Law Prof: My experience has been that they will often start raising their voices and flying into rages. Most neocalvinists are in my experience little, insecure boys who are quite terrified that the pegs of their theology might be knocked from under them, so they’ll try to bully any opposition into silence. This is very typical of one who derives no comfort from the Lord and has no peace in their beliefs. I think a very high percentage of neocals (as opposed to old school reformed types from way back) have nothing but a series of doctrines and memorized scriptures and heroes to worship—but many of them do not appear to have the joy and peace that comes from a real relationship with Jesus. readingalong: Max: All eyes are now turned to HBC-Naples. Will MacDonald actually preach there? Apparently Roys was in Naples Sunday (missed the service due to flight issues) and is planning a story. I hope that it provides details as to how Secrest and his elders were wooed and seduced. Did they get to enjoy the hunting camp? Someone mentioned – which I would like to see verified – that the Naples elders were taken to Ireland for a golf trip. Who knows what other juicy carrots were waved in front of them? What is the likelihood that they will soon join Secrest, and be replaced by MacDonald’s handpicked yesmen? And the congregation, naive and mostly ignorant of JMac’s controversial past, will never know what hit them. At least, not until it is far too late to do anything but leave. hoodaticus: In case you’re wondering, I still believe in both predestination and free will at the same time (a la Jonathan Edwards) but I’m now a universalist who believes even the devil will be saved: everyone is ultimately predestined, so that nothing God sent out from Himself will return to Him void, and so that every knee in heaven and on earth will bow and confess their Savior. Pretty difficult to imagine these guys not ‘in cahoots’ – they have a long and storied shared history. Well, in the short space of time since I prophesied that England would show the Windies the true meaning of “collapse”, I have been shown to be a true biblical cricket prophet. The Windian attack has utterly destroyed an abject English batting line-up in only 30 overs (and even then at barely over 2 runs an over). This is one of the most humiliating defeats an English Test side has suffered, with a 5-day game finished inside 2 days. At one level, this is surprising; England completed a fine series win in Sri Lanka late last year and the Windies weren’t in spectacular form coming into this match. But it’s a funny old game. I need a sabbatical. Naples would be perfect for that. Now if I could just figure out how to get other people to pay for it. Maybe I’m in the wrong business, or I just need a better racket. Or maybe I should just get ordained. The double standard is staggering. Samuel Conner: The brains of people with sociopathic traits are distinguishable from the general population in functional MRI scans. The consensus in the medical profession is that people with these traits do not change. Counseling, therapy, confrontation, soul-cure, you name it; nothing works. The only humane solution is to keep them out of positions that give them the power to hurt others. For that, of course, one needs to identify them. Maybe my ‘lost’ response will magically appear, but, in all honesty, I find your scientific solutions much more frightening than what we have now. I do not have that kind of ‘faith’ in men, their motives or their inventions. It would require ignoring a vast history of brutal experimentation on orphans, prisoners and the mentally feeble, not to mention the entire human population, along with the misuse of countless technologies initially presented as beneficial and ‘progress’. Any time there exists a machine, however beneficial, there exists the possibility of some malign person or persons co-opting that machine for unrevealed purposes. Machines simply do what they are programmed to do, which is why the only genuine prevention of evil is a moral being. What would keep, say, the likes of a JMac or Driscol or perhaps one far more nefarious, from employing just such a device as you recommend, with the scientific ‘evidence’ that proves that all dissenters have the same brain waves, suggesting latent violent tendencies that make them a risk to a church or society? Nah, couldn’t happen. Dissenters have never been locked up as schizophrenics, or mentally unsound dangers to society. Science is so sure, so sound, so safe; so never, ever proven wrong or misused for political or social control purposes. And I believe in Santa Claus. Scripture suggests a far safer alternative than simply switching our allegiance from so-called Religious authorities to so-called Scientific authorities, which retains the dangerous action of trusting submission to authorities who cannot be verified to be trustworthy. Jesus did not promise his disciples, ‘And lo, when I go, I will introduce scientific breakthroughs to enable you to see inside the brains of men and know who is trustworthy’. He promised the very Spirit of God, which I consider far more trustworthy than ‘Science’ to provide the answers to centuries of never-ending problems created by wicked, deceitful men. The proof is always in the pudding. The tree always, eventually, provides verifiable evidence of what kind of sap is flowing within its hidden veins. A bad tree will not produce good fruit, plain and simple. Modern science thinks its so clever, crossing species boundaries that were long ago established by God. I suppose you are aware of well-credentialed dissenters to genetic modification, who warn that adequate studies have not been done to establish necessary proof of the long-term safety of such finagling? But only science deniers would assert the proven dangers of FDA approved drugs, once lauded tobacco, and countless other scientific ‘facts’ proven to be not so factual, right? I would sincerely encourage people to give no man – religious, political or scientific – unquestioning authority to declare orthodox Truth. The very same tactics of seduction, manipulation, extortion, etc. that have proven useful throughout history to allow evil to prevail over seemingly wise, well-meaning individuals are effective in non-religious as well as religious organizations. In all of its guises, Evil, distills down into the one act that God can never be legitimately accused of: compelling men to submit – even to perfect Truth – against their will. That, IMO, distinguishes powers of good from powers of evil. Goodness lays down its own life for the sake of others. Evil demands unquestioning submission to some proclaimed ‘authority’ for ‘the greater good’. GSD [Getting Stuff Done]: I need a sabbatical. Naples would be perfect for that. Now if I could just figure out how to get other people to pay for it. Mega-church leaders essentially have an on-going “GoFundMe” account … better known as the pew. TS00: A less kind and gentle person might suggest that these ‘Peacemaker’ organizations exist to silence and disburse dissent, under pretense of adhering to scriptural principles of addressing relational issues. Remember who signs the Peacemaker’s paychecks. Root 66: Is he really saying that it doesn’t matter what he does, so long as he preaches correctly? In Hunger Games, wasn’t “Peacekeepers” the name of the Panem regime’s Enforcers? And in Babylon-5, when the Earth Alliance president staged his coup, didn’t he set up a group (armbands and all) called the “Peacemakers”? Was missing your input last will on Twitter while we were planning “Church: The Tabletop RPG”. Question came up on who got to rerolls their class. Megachurches pastors? Ideally, congregations would not hire outsiders to fulfill ministry functions at all, but would instead “promote from within” people who were known to be of demonstrated good character through long association and service. Unfortunately, we already have “scientific” methods in the churches — ministry training of youngsters is like secular professional education and IMO bears next to no resemblance to the little one can discern in Scriptures of the formation of servants of the Gospel. If I were on a pastoral search committee, I would really want to know how the candidates presented to the committee scored on indices of sociopathy and narcissism. TS00: Modern science thinks its so clever, crossing species boundaries that were long ago established by God. I suppose you are aware of well-credentialed dissenters to genetic modification, who warn that adequate studies have not been done to establish necessary proof of the long-term safety of such finagling? Man-Oh-Manischewitz you’ve said a mouthful here and I agree. Let’s hope they don’t do too much fiddlin’ and fartin’ around with various genome ‘edits’. Despite what the starry-eyed advocates claim, my gut feeling tells me that it will not end well. The Sorcerer’s Apprentice sequence from Disney’s Fantasia (1940) is both prophetic and instructive in this regard. Max: Mega-church leaders essentially have an on-going “GoFundMe” account … better known as the pew. Love it – nominate for comment of the week! Wow. “Senior Pastor” and preaching *every* weekend. From the slick promotional material, this appears to be long in the planning. So could the Naples church members reverse the firing and pull out of HBC? Or would they lose the physical property because of some clause in the agreement they made? What’s that old saying about dancing with the devil? Is he really saying that it doesn’t matter what he does, so long as he preaches correctly?If that’s the case, he’s sicker than I thought.Sorry Mac, but I have long known that a person’s lifestyle and actions are PART of their message, and an integral component of a person’s testimony!However, your lifestyle and behavior are drowning out any ‘message’ you could possibly hope to deliver! This seems to be an increasingly heard message among the neo-cal crowd, especially when an elder has been accused of being overbearing. Too bad they can quote the scriptures but don’t actually seem to believe it applies to them. refugee: So could the Naples church members reverse the firing and pull out of HBC? Or would they lose the physical property because of some clause in the agreement they made? That’s a very good question. Though, given their choice of lawsuit lawyers, maybe their contracts are done just as poorly? refugee: So could the Naples church members reverse the firing and pull out of HBC? HBC-Naples membership don’t have any say in who they affiliate with. They have elder-rule polity in place, not congregational governance. Is this traditional test cricket, ODI, or Twenty20?? And my first experience watching cricket was the CPL Twenty20 tournament on Willow (which my cable provider no longer offers). The crowds were having so much fun. So since the US has no national team, Go Windies! Back in the 1980s, when the Jamaican cricket team was a threat to British hopes, I saw a scientist on BBC television explaining the problem, using skeletons as visual aids. He effectively accused the Jamaicans of cheating by having longer femurs. Samuel Conner: Ideally, congregations would not hire outsiders to fulfill ministry functions at all, but would instead “promote from within” … I would really want to know how the candidates presented to the committee scored on indices of sociopathy and narcissism. Re: promoting from within, that wheel has already been invented. Several denominations have lengthy multi-year discernment committees that raise up members of a congregation to test a call to the ministry. These lay committees stay with the person all the way through ordination. I know a psychologist who rigorously screens would-be seminarians for his Roman Catholic archdiocese. This is one way to keep emotionally stunted men out of the ordination track. In other denominations, psychological testing is done in ordination processes associated with academically rigorous seminaries. Of course, a lot of churches don’t want to go anywhere near psychology or worldly higher education. Glad to hear of this. My denominational exposure has been to groups that are more allergic to psychology. In addition to being a matter of “good practice”, I think its also compassionate toward the candidates for ministry. It’s not a kindness to encourage people to spend years of their lives preparing for a function that they are not going to thrive in and are likely to ultimately wash out of. I have seen this happen. well, it comes down to “do i want to associate with this person?” if the answer is, “no, not really”, then there it is. as to a pastor, i truly can’t see how i or any adult needs a shepherd, needs to be protected. protected from what? we’re responsible adults. whenever i hear the word pastor or shepherd, it’s like christian culture is obligating me to return to 7 years old and let some random adult be in charge of me. why? is it that since the bible mentions the word ‘pastor’ therefore we must be in a pastor/underling relationship in order to be biblical? kind of like my kids’ former youth group amounted to them listening to the youth pastor ‘preach’, which i figured was so they could be ‘biblical’ (since preaching is in the bible). nevermind the fact the kids were too brain-tired from school to be able to pay attention. it’s sick, silly, stupid…. how many other s words can we come up with? elastigirl: it’s sick, silly, stupid…. how many other s words can we come up with? How about the one that starts with an ‘s’ and ends with a ‘y’? Thou shalt not bowl bouncers to Garner, Marshall or Holding, if thou knowest what is good for thee. well, it comes down to “do i want to associate with this person?”if the answer is, “no, not really”, then there it is. as to a pastor, i truly can’t see how i or any adult needs a shepherd, needs to be protected.protected from what?we’re responsible adults. why?is it that since the bible mentions the word ‘pastor’ therefore we must be in a pastor/underling relationship in order to be biblical? kind of like my kids’ former youth group amounted to them listening to the youth pastor ‘preach’, which i figured was so they could be ‘biblical’ (since preaching is in the bible).nevermind the fact the kids were too brain-tired from school to be able to pay attention. it’s sick, silly, stupid….how many other s words can we come up with? Don’t get me wrong – I see no scriptural basis for the position of pastor, or any ‘authority’ in the Body of Christ. But it may be naive to assume that there are no children in the ‘family’, or weaker brothers. A lot of needy people come, as a final desperate hope, to the church for assistance. Some need food, clothing and shelter. Some need help escaping abusive domestic situations. Some need help getting their kid out of jail. Some just need help learning to think and make good decisions. Anyway, a lot of people really do need someone to watch their backs while they are down. And many look to ‘the pastor’ or The Church to be that ‘someone’. The stronger, or better established, can walk away from an abusive church situation and start over. I can whine and cry about how much pain I suffered in the church – and I do – but at least I was able to walk away. I felt sucker-punched for a while, and needed emotional ‘shelter’ so I could lick my wounds. But I walked away. There are so many in our world who can’t walk away; they’ve tried secular social services and they’ve appealed to friends and family. Forget the reasons, the needs are genuine. These are the ones I am most concerned about, even if they are, admittedly, the most difficult to invite into my comfortable life. I encountered my first bully in kindergarten. I’m no saint, and I don’t have it all together, but when I see someone weaker or needier getting picked on, I’m not going to just stand there and do nothing. It’s just being a decent human being. I realize that ‘The Church’ doesn’t have to be the only answer. I’m trying to figure out how to plug in elsewhere. The faces of many who passed through ‘my’ church, who I thought ‘we’ were helping, but who left as bad off, or worse, than they came, haunt me. Maybe JMac can build mega empires. I always thought we were about helping each other get by. there are needs for help, support, encouragement, advice, dialogue. just can’t stop scratching & shivering when i hear a professional christian say “care for you”, when i know it means “control you” and “tell you what to think and do” while either pouring syrup all over you or berating you. Give me a non-hierarchical, Quaker like gathering, in which people share, discuss, ask questions, pray for one another, contribute (voluntarily) to others’ needs, and you’ve got a ‘church’ I could be a part of. No pastor, no ‘leaders’, aside from the natural, self-sacrificing leadership that steps out to wash feet and lay down one’s own life for others. why in the world did Quakerism not take off more? this should be the standard, not this hierarchical bull$h|t foisted on us all. Besides the obvious human nature stuff, take a look at the laws defining what our friend Sopy calls the 501(c)(3) churches; that’s there one finds codified the authoritarian-led, hierarchical institution with a seminary trained ‘ruler’ and official orthodoxy. If ya care about the money, you’re going to look like a ‘proper’ church. Then infiltrate genuine, loving, functioning bodies with a snake or two, and people will flock to the ‘safety’ of the ‘plurality of elders’. With ‘nowhere else to go’, people simply choose what they can best stomach. Been there, done that. Burned the shirt.